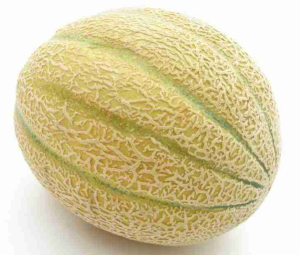 Muskmelon is a species of melon that has been developed into many cultivated varieties. These include smooth skinned varieties such as honeydew, crenshaw and casaba, and different netted cultivars. The Armenian cucumber is also a variety of muskmelon, but its shape, taste, and culinary uses more closely resemble those of a cucumber. The large number of cultivars in this species approaches that found in wild cabbage, though morphological variation is not as extensive. It is a fruit of a type called pepo. Muskmelon is native to Persia (Iran), Anatolia, Armenia, and adjacent areas on the west and the east which is believed to be their center of origin and development, with a secondary center including the northwest provinces of India and Afghanistan. In addition to their consumption when fresh, juice, salad, melons are sometimes dried. Other varieties are cooked, or grown for their seeds, which are processed to produce melon oil. Still other varieties are grown only for their pleasant fragrance. The Japanese liqueur Midori is flavored with muskmelon. 4. Is also an anti oxidant. Also see Melon Peeler, Melon Baller, Melon Scooper. Recipe using muskmelon see Here and Here and Here and Here.